Manuel Bravo, Luís Rodrigues, Peter Van Roy. Saturn: a Distributed Metadata Service for Causal Consistency. European Conference on Computer Systems (EuroSys), Belgrade, Serbia. April 2017. Albert van der Linde, Pedro Fouto, João Leitão, Nuno Preguiça, Santiago Castiñeira and Annette Bieniusa. Legion: Enriching Internet Services with Peer-to-Peer Interactions. Int. Conf. on World Wide Web 2017 (WWW 2017), Perth, Australia, May 2017. Marc Shapiro, Masoud Saeida Ardekani, and Gustavo Petri. Consistency in 3D. Int. Conf. on Concurrency Theory (CONCUR), pages 3:1–3:14, Québec, Québec, Canada, August 2016. Schloss Dagstuhl – Leibniz- Zentrum für Informatik, Dagstuhl Publishing, Germany. D. D. Akkoorath, A. Z. Tomsic, M. Bravo, Z. Li, T. Crain, A. Bieniusa, N. Preguiça, M. Shapiro, Cure: Strong semantics meets high availability and low latency, Int. Conf. on Dist. Comp. Sys. (ICDCS), Nara, Japan, June 2016. Carlos Baquero and Nuno M. Preguiça. Why logical clocks are easy. Communications of the ACM, 59(4):43--47, April 2016. Valter Balegas, Cheng Li, Mahsa Najafzadeh, Daniel Porto, Allen Clement, Sérgio Duarte, Carla Ferreira, Johannes Gehrke, João Leitão, Nuno Preguiça, Rodrigo Rodrigues, Marc Shapiro, and Viktor Vafeiadis. Geo-replication: Fast if possible, consistent if necessaryData Engineering Bulletin, 39(1):81--92, March 2016. Alexey Gotsman, Hongseok Yang, Carla Ferreira, Mahsa Najafzadeh, Marc Shapiro, 'Cause I'm Strong Enough: Reasoning about Consistency Choices in Distributed Systems (POPL), January 2016, St.Petersburg, Florida, USA. Valter Balegas, Sérgio Duarte, Carla Ferreira, Rodrigo Rodrigues, Nuno Preguiça, Mahsa Najafzadeh and Marc Shapiro. Putting Consistency back into Eventual Consistency. European Conference on Computer Systems (EuroSys), April 2015. Marek Zawirski, Nuno Preguiça, Sergio Duarte, Annette Bieniusa, Valter Balegas, Marc Shapiro. Write Fast, Read in the Past: Causal Consistency for Client-side Applications, Middleware 2015, Dec. 2015. Vancouver, BC, Canada. Valter Balegas, Diogo Serra, Sergio Duarte, Carla Ferreira, Marc Shapiro, Rodrigo Rodrigues and Nuno Preguiça. Extending Eventually Consistent Cloud Databases for Enforcing Numeric Invariants. 34th International Symposium on Reliable Distributed Systems (SRDS 2015), Montreal, Quebec, Sept. 2015. Christopher Meiklejohn and Peter Van Roy. Lasp: A Language for Distributed, Coordination-Free Programming. International Symposium on Principles and Practice of Declarative Programming (PPDP). July 2015, Siena, Italy. Ruma Paul. Designing Distributed Applications Using a Phase-Aware, Reversible System. Int. Conf. on Edge Computing, June 2017, Honolulu, Hawaii, USA. Manuel Bravo, Luís Rodrigues, and Peter Van Roy. Saturn: a distributed metadata service for causal consistency. In Euro. Conf. on Comp. Sys. (EuroSys), Belgrade, Serbia, April 2017. Assoc. for Computing Machinery. Albert van der Linde, Pedro Fouto, João Leitão, Nuno Preguiça, Santiago Castiñeira, and Annette Bieniusa.Enriching internet services with peer-to-peer interactions.In Int. Conf. on World Wide Web (WWW), Perth, Australia, April 2017. Loïck Briot, Pascal Urso, and Marc Shapiro. High responsiveness for group editing CRDTs. In Int. Conf. on Supporting Group Work, pages 51--60, Sanibel Island, FL, USA, November 2016. Ali Shoker. Exploiting universal redundancy. In Int. Symp. on Network Computing and Applications (NCA), pages 199--203, Cambridge, MA, USA, October 2016. doi: 10.1109/NCA.2016.7778617. Peter Zeller and Arnd Poetzsch-Heffter. Towards a proof framework for information systems with weak consistency. In Int. Conf. on Software Engineering and Formal Methods (SEFM), pages 277--283, Vienna, Austria, July 2016. Deepthi Devaki Akkoorath, Alejandro Z. Tomsic, Manuel Bravo, Zhongmiao Li, Tyler Crain, Annette Bieniusa, Nuno Preguiça, and Marc Shapiro. Cure: Strong semantics meets high availability and low latency. In Int. Conf. on Distributed Comp. Sys. (ICDCS), pages 405--414, Nara, Japan, June 2016. Filipe Freitas, João Leitão, Nuno Preguiça, and Rodrigo Rodrigues. Characterizing the consistency of online services (practical experience report). In Int. Conf. on Dependable Systems and Networks (DSN), pages 638--645, Toulouse, France, June 2016. Alexey Gotsman, Hongseok Yang, Carla Ferreira, Mahsa Najafzadeh, and Marc Shapiro. 'Cause I'm strong enough: Reasoning about consistency choices in distributed systems. In Symp. on Principles of Prog. Lang. (POPL), pages 371--384, St. Petersburg, FL, USA, 2016. Christopher Meiklejohn, Seyed H. Haeri, and Peter Van Roy. Declarative, sliding window aggregations for computations at the edge. In Consumer Communications & Networking Conference (CCNC), pages 32–37, Las Ve- gas, NV, USA, January 2016. Marek Zawirski, Nuno Preguiça, Sérgio Duarte, Annette Bieniusa, Valter Balegas, and Marc Shapiro. Write fast, read in the past: Causal consistency for client-side applications. In Int. Conf. on Middleware (MIDDLEWARE), pages 75--87, Vancouver, BC, Canada, December 2015. ACM/IFIP/Usenix. Iwan Briquemont, Manuel Bravo, Zhongmiao Li, and Peter Van Roy. Conflict-free Partially Replicated Data Types. In Proceedings of the 7th IEEE International Conference on Cloud Computing Technology and Science (CloudCom 2015). IEEE, Nov 2015. Deepthi Devaki Akkoorath and Annette Bieniusa. Transactions on mergeable objects. In Asian Symposium on Pg. Lang. and Sys. (APLAS), pages 427--444, Pohang, South Korea, November 2015. Valter Balegas, Diogo Serra, Sérgio Duarte, Carla Ferreira, Marc Shapiro, Rodrigo Rodrigues, and Nuno Preguiça. Extending eventually consistent cloud databases for enforcing numeric invariants. In Symp. on Reliable Dist. Sys. (SRDS), pages 31--36, Montréal, Canada, September 2015. IEEE Comp. Society. Ricardo Gonçalves and Paulo Sergio Almeida and Carlos Baquero Moreno and Vitor Fonte, Concise Server-Wide Causality Management for Eventually Consistent Data Stores, International Conference on Distributed Applications and Interoperable Systems (DAIS), Grenoble France, June 2015. Ricardo Gonçalves, Paulo Sérgio Almeida, Carlos Baquero, Victor Fonte. Concise Server-Wide Causality Management for Eventually Consistent Data Stores. International Conference on Distributed Applications and Interoperable Systems (DAIS), Grenoble, France, June 2015: 66-79. Paulo Sergio Almeida, Ali Shoker, and Carlos Baquero. Efficient State-based CRDTs by Delta-Mutation. International Conference of Networked sYStems (NETYS'15) , Agadir, Morocco, May 2015. Vinh Tao, Marc Shapiro, Vianney Rancurel. Merging semantics for conflict updates in geo-distributed file systems. International Systems and Storage Conference (SYSTOR), Haifa, Israel, May 2015. M. Saeida-Ardekani, P. Sutra, M. Shapiro. G-DUR: A Middleware for Assembling, Analyzing, and Improving Transactional Protocols. Middleware, Bordeaux, France, Dec. 2014. Marcos K. Aguilera, Leonardo Querzoni and Marc Shapiro. Principles of Distributed Systems. The 18th International Conference on Principles of Distributed Systems. December 2014, Cortina d'Ampezzo, Italy. Peter Zeller, Annette Bieniusa, and Arnd Poetzsch-Heffter. Formal specification and verification of CRDTs. Formal Techniques for Distributed Objects, Components, and Systems (FORTE), Berlin, June 2014, pages 33--48. Springer. Carlos Baquero, Paulo Sérgio Almeida, and Ali Shoker. Making operation-based CRDTs operation-based. Distributed Applications and Interoperable Systems (DAIS), Berlin, June 2014, pages 126--140. Springer. Paulo Sérgio Almeida, Carlos Baquero, Ricardo Gonçalves, Nuno Preguiça, and Victor Fonte. Scalable and accurate causality tracking for eventually consistent stores. Distributed Applications and Interoperable Systems (DAIS), Berlin, June 2014, pages 67--81. Springer, 2014. Natalia Chechina, Kenneth MacKenzie, Simon Thompson, Phil Trinder, Olivier Boudeville, Viktória Fördős, Csaba Hoch, Amir Ghaffari, and Mario Moro Hernandez. Evaluating Scalable distributed Erlang for scalability and reliability. IEEE Trans. on Parallel and Dist. Sys. (TPDS), PP(99):1–1, January 2017. Valter Balegas, Cheng Li, Mahsa Najafzadeh, Daniel Porto, Allen Clement, Sérgio Duarte, Carla Ferreira, Johannes Gehrke, João Leitão, Nuno Preguiça, Rodrigo Rodrigues, Marc Shapiro, and Viktor Vafeiadis. Geo-replication: Fast if possible, consistent if necessary. Data Engineering Bulletin, 39(1):81--92, March 2016. Carlos Baquero and Nuno M. Preguiça. Why logical clocks are easy. ACM Queue, 14(1):60, January 2016. Marc Shapiro. Bringing the cloud closer to users. 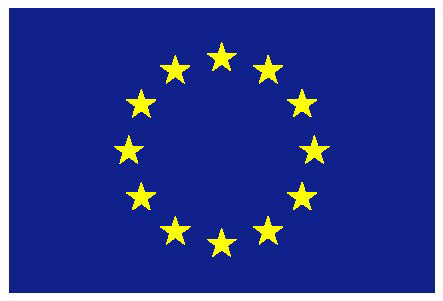 EU Research, 2015(1):68–69, September 2015. Mehdi Ahmed-Nacer, Pascal Urso, and François Charoy. Merging by decentralized eventual consistency algorithms. EAI Endorsed Transactions on Collaborative Computing, 1(6), January 2015. W. on Principles and Practice of Consistency for Distributed Data (PaPoC). London, UK, April 2016. Marek Zawirski, Carlos Baquero, Annette Bieniusa, Nuno M. Preguiça, Marc Shapiro: Eventually consistent register revisited. Carlos Baquero, Paulo Sérgio Almeida, Carl Lerche: The problem with embedded CRDT counters and a solution. Russell Brown, Zeeshan Lakhani, and Paul Place. 2016. Big(ger) sets: decomposed delta CRDT sets in Riak. Workshop on Planetary-Scale Distributed Systems (W-PSDS), Montréal, Canada, Sept. 2015. W. on Principles and Practice of Consistency for Distributed Data (PaPoC). Bordeaux, France, April 2015. C. Meiklejohn and P. Van Roy. LASP: Distributed, Eventually Consistent Computations. Santiago Castiñeira and Annette Bieniusa: Collaborative offline web applications using Conflict-free Replicated Data Types. Tyler Crain and Marc Shapiro: Designing a causally consistent protocol for geo-distributed partial replication. Alejandro Z.Tomsic, Tyler Crain and Marc Shapiro: An empirical perspective on causal consistency. Amadeo Ascó and Annette Bieniusa: Adaptive strength geo-replication strategy. David Navalho, Sergio Duarte, Nuno Preguica. A Study of CRDTs that do Computations. W. on Principles and Practice of Eventual Consistency (PaPEC), Amsterdam, the Netherlands, April 2014. Russell Brown, Sean Cribbs, Sam Elliott and Christopher Meiklejohn: Riak DT Map: A Composable, Convergent Replicated Dictionary. Paulo Sérgio Almeida, Ali Shoker and Carlos Baquero: Efficient State-based CRDTs by Decomposition (Work in progress report). Carlos Baquero, Paulo Sérgio Almeida and Ali Shoker: Making operation based CRDTs operation based (Work in progress report). Mehdi Ahmed-Nacer, Pascal Urso, Nuno Preguiça and Valter Balegas: Merging OT and CRDT Algorithms. Valter Balegas and Mahsa Najafzadeh: The Case for Fast and Invariant-Preserving Geo-Replication. Burcu Külahçıoğlu Özkan, Erdal Mutlu and Serdar Tasiran: Towards Verifying Eventually Consistent Applications. Christopher Meiklejohn: On the Composability of the Riak DT Map: Expanding From Embedded To Multi-Key Structures (work in progress report). 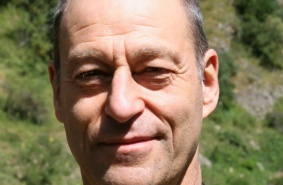 Christopher S. Meiklejohn, Peter Van Roy. Loquat: A Framework for Large-Scale Actor Communication on Edge Networks. International Workshop on Smart Edge Computing and Networking (SmartEdge 2017), Kona, Big Island, Hawaii, USA, March 2017. Mathias Weber, Annette Bieniusa, Arnd Poetzsch-Heffter. Access Control for Weakly Consistent Replicated Information Systems. Int. W. on Security and Trust Management (STM), Heraklion, Crete, Greece, 26-27 September 2016, pages 82–97. Springer. Viktória Fördős, Francesco Cesarini. CRDTs for the Configuration of Distributed Erlang Systems. Erlang’16, September 2016, Nara, Japan. pp.42--53. Vitor Enes, Carlos Baquero, Paulo Sérgio Almeida, Ali Shoker: Join Decompositions for Efficient Synchronization of CRDTs after a Network Partition: Work in progress report. PMLDC@ECOOP, Rome, Italy, July 2016. Georges Younes, Ali Shoker, Paulo Sérgio Almeida, Carlos Baquero: Integration Challenges of Pure Operation-based CRDTs in Redis. PMLDC@ECOOP, Rome, Italy, July 2016. Peter Zeller and Arnd Poetzsch-Heffter, Towards a Proof Framework for Information Systems with Weak Consistency, Software Engineering and Formal Methods. Vienna, Austria, July 2016. Haeri, S. H., P. Van Roy, C. Baquero, and C. Meiklejohn, Worlds of Events: Deduction with Partial Knowledge about Causality, ICE 2016, Heraklion, Greece, June 2016. C. Meiklejohn, Haeri, S. H., and P. Van Roy, Declarative, Sliding Window Aggregations for Computations at the Edge, in 13th CCNC, Las Vegas, USA: IEEE, Jan. 2016, pp. 32--37. Deepthi Akkoorath and Annette Bieniusa, Transactions on Mergeable Objects, Asian Symposium on Programming Languages and Systems (APLAS), Pohang, Korea, Dec. 2015. Valter Balegas, Sergio Duarte, Carla Ferreira, Rodrigo Rodrigues and Nuno Preguiça. The quest for coordination-free cloud storage (Poster). 25th ACM Symposium on Operating Systems Principles (SOSP '15), Monterey, CA, Oct. 2015. C. Meiklejohn and P. Van Roy. The Implementation and Use of a Generic Dataflow Behaviour in Erlang. 4th ACM SIGPLAN Erlang Workshop, Vancouver, BC, Canada, Sep. 2015. Christopher Meiklejohn and Peter Van Roy. Selective hearing: An approach to distributed, eventually consistent edge computation. In Symp. on Reliable Distributed Systems Workshop (SRDSW), pages 62–67, Montr ́eal, Canada, September 2015. C. Meiklejohn. Highly Distributed Computations Without Synchronization. InfoQ,, Feb., 2015. Valter Balegas, Sergio Duarte, Carla Ferreira, Rodrigo Rodrigues, Nuno Preguiça, Mahsa Najafzadeh and Marc Shapiro. Towards Fast Invariant Preservation in Geo-replicated Systems. ACM SIGOPS Operating Systems Review - Special Issue on Repeatability and Sharing of Experimental Artifacts. Volume 49 Issue 1, January 2015. Pages 121-125. V. Balegas, N. Preguiça, S. Duarte, C. Ferreira, R. Rodrigues, M. Najafzadeh, M. Shapiro. The Case for Fast and Invariant-Preserving Geo-Replication.W. on Planetary-Scale Distributed Systems (W-PSDS). co-located with SRDS, Nara, Japan October 2014. Manuel Bravo, Zhongmiao Li, Peter Van Roy, and Christopher Meiklejohn. Derflow: Distributed Deterministic Dataflow Programming for Erlang. Erlang Workshop, Göteborg, Sweden, Sep. 2014. Mahsa Najafzadeh, Marc Shapiro, Valter Balegas and Nuno Preguiça. Improving the scalability of geo-replication with reservations. Distributed Cloud Computing (DCC), Dresden, Germany, Dec. 2013. 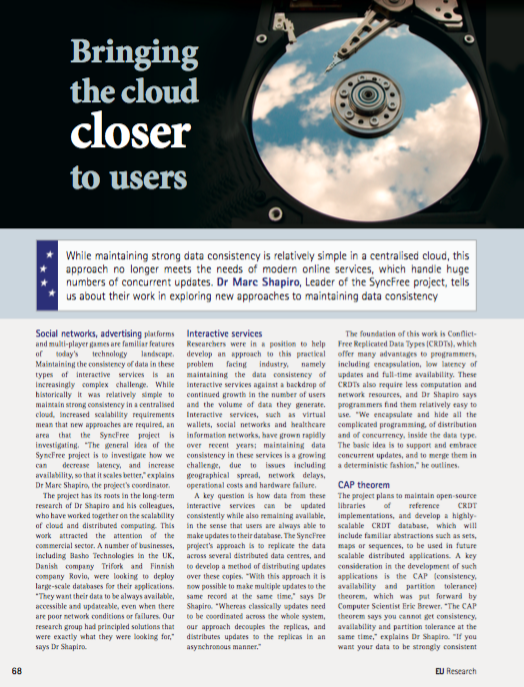 SyncFree Position Paper published at Cloudscape VI. Position paper at CloudWatchHUB concentration meeting. Sebastian Burckhardt, Alexey Gotsman, Hongseok Yang, Marek Zawirski: Replicated Data Types: Specification, Verification, Optimality. POPL 2014. Marc Shapiro, Nuno M. Preguiça, Carlos Baquero, Marek Zawirski: Conflict-Free Replicated Data Types. SSS 2011: 386-400. Annette Bieniusa, Marek Zawirski, Nuno M. Preguiça, Marc Shapiro, Carlos Baquero, Valter Balegas, Sérgio Duarte: An optimized conflict-free replicated set. CoRR abs/1210.3368 (2012). Annette Bieniusa, Marek Zawirski, Nuno M. Preguiça, Marc Shapiro, Carlos Baquero, Valter Balegas, Sérgio Duarte: Brief Announcement: Semantics of Eventually Consistent Replicated Sets. DISC 2012: 441-44. Marc Shapiro, Nuno M. Preguiça, Carlos Baquero, Marek Zawirski: Convergent and Commutative Replicated Data Types. Bulletin of the European Association for Theoretical Computer Science (EATCS), Number 104, June 2011. MarcShapiro, Nuno M.Preguiça, CarlosBaquero, MarekZawirski: A comprehensive study of Convergent and Commutative Replicated Data Types. INRIA Technical Report RR-7506, January 2011. Marek Zawirski, Annette Bieniusa, Valter Balegas, Sérgio Duarte, Carlos Baquero, Marc Shapiro, Nuno M. Preguiça: SwiftCloud: Fault-Tolerant Geo-Replication Integrated all the Way to the Client Machine. CoRR abs/1310.3107 (2013). Bryan Fink: Distributed computation on dynamo-style distributed storage: riak pipe, Erlang Workshop '12. Christopher Meiklejohn: Riak PG: distributed process groups on dynamo-style distributed storage, Erlang Workshop '13. Nuno M. Preguiça, Carlos Baquero, Paulo Sérgio Almeida, Victor Fonte, and Ricardo Gonçalves. Brief announcement: Efficient causality tracking in distributed storage systems with dotted version vectors. In Proceedings of the 2012 ACM symposium on Principles of distributed computing (PODC '12). ACM, 335-336, 2012. Programming Models and Languages for Distributed Systems: The Mozart Programming System. Seif Haridi, Peter Van Roy, Per Brand, Michael Mehl, Ralf Scheidhauer, Gert Smolka: Efficient logic variables for distributed computing. ACM Trans. Program. Lang. Syst. 21(3): 569-626 (1999). Seif Haridi, Peter Van Roy, Per Brand, Christian Schulte: Programming Languages for Distributed Applications. New Generation Comput. 16(3): 223-261 (1998). Peter Van Roy, Seif Haridi, Per Brand, Gert Smolka, Michael Mehl, Ralf Scheidhauer: Mobile Objects in Distributed Oz. ACM Trans. Program. Lang. Syst. 19(5): 804-851 (1997). Collet, Raphaël. The Limits of Network Transparency in a Distributed Programming Language. Université Catholique de Louvain, Belgium (2007). Elmas, Tayfun, Qadeer, Shaz, Tasiran, Serdar: A Calculus of Atomic Actions, Proceedings of the 36th Annual ACM SIGPLAN-SIGACT Symposium on Principles of Programming Languages, ACM, 2--15, 2009. Elmas, Tayfun: QED: A Proof System Based on Reduction and Abstraction for the Static Verification of Concurrent Software, Proceedings of the 32Nd ACM/IEEE International Conference on Software Engineering - Volume 2, ACM, 507--508, 2010. Elmas, Tayfun, Qadeer, Shaz, Sezgin, Ali, Subasi, Omer, Tasiran, Serdar: Simplifying Linearizability Proofs with Reduction and Abstraction, Proceedings of the 16th International Conference on Tools and Algorithms for the Construction and Analysis of Systems, Springer-Verlag, 296--311, 2010. Sezgin, Ali, Tasiran, Serdar, Qadeer, Shaz: Tressa: Claiming the Future, Proceedings of the Third International Conference on Verified Software: Theories, Tools, Experiments, Springer-Verlag, 25--39, 2010.